This story feels so familiar. We've been through this before with Carlos Zambrano. Heck, the cubs organization has went through something similar with Sammy Sosa and Milton Bradley. Of course, Carlos Zambrano will not retire. He's made a lot of money in his career, but certainly he will not walk away from another $22 million coming his way. This story feels like it's developed for the great blog It Is About the Money, Stupid. This isn't a player with bright prospects for life after baseball. He hasn't demonstrated an aptitude for anything more than throwing heavy sinkers and hitting long fly balls. He won't retire, but he's likely signed his ticket out of town. His mentality has always been shaky, immature, and of course volatile. But, he was our crazy Big Z. Sometimes, his passion was an asset. He'd fire up himself, the fans, and even distract the focus of opponents when he seemed wildly unpredictable on the hill. Carlos Zambrano came up to the Cubs as a very young man and showed an exciting ability to throw strikes and get hitters out. He blossomed as an elite pitcher in the shadows of Prior and Wood, then developed into the ace after their careers veered in different directions. His ace status never seemed to shine that bright. Perhaps the mileage on his arm, combined with his less than peak physical shape, have caused his fastball to slow down and movement to diminish. On the bright side, he is still theoretically young enough to rebound and have a few more good years. Time will tell. 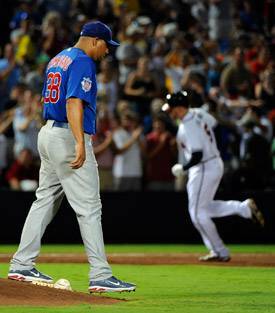 I'm afraid Carlos Zambrano has played his last game as a Chicago Cub. Still, the feelings today don't have the usual kind of shock or surprise that come with sudden retirement talk and teams disqualifying a player. Heck, I had a feeling his blood would be boiling relatively soon. It's inexplicable almost, but I was anticipating some fireworks. In fact, a few hours before his start, I half jokingly tumblr'd a picture of Big Z with two hashtags: #Zambrano and #crazy. Thirty days of no pay and no contact with the team should do Carlos Zambrano some good. It seems like this is another black eye for an ogranization that has been in the infirmary for the past century. The Cubs are losing more and more credibility with the fans with the passing of time. Expect this to play out like Sosa and Bradley. Zambrano will likely be DQ'd the rest of the season, then traded somewhere for a really bad contract (think Carlos Silva) or a couple of non-prospects, with the Cubs still paying most of the 22 mil.